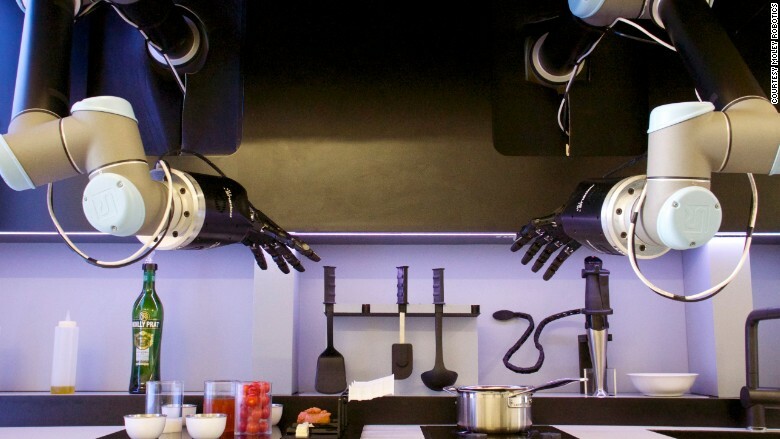 Robo chef: Would you trust a cook with no taste buds? "Never trust a skinny chef," goes the old saying. But what about one without taste buds? It might not be able to sample its own handy work, but this robot chef can whip up an apparently "delicious" crab bisque in just 30 minutes -- the first of an expected repertoire of 2,000 recipes. Much like an "iTunes of food," consumers will be able to select dishes from the mechanical cook's vast digital library, all served up in their very own kitchen. Though judging by this prototype, they'll have to make sure each ingredient, spoon, and pan is perfectly placed first. Modeled on the movements of Britain's 2011 Master Chef winner Tim Anderson, the robot is programmed to reach, stir, and pour, in exactly the same way as its human teacher, right down to the precise tilt of an olive oil bottle. "The current model is purely based on rote movements, so if anything is out of place it won't work," said Anderson, who worked with British company Moley Robotics to create the machine, due to go on sale in 2017 with an estimated price tag of $15,000. "One of the biggest challenges is that ingredients are so inconsistent -- they come in different shapes and sizes, and are in different places all over the kitchen," said Anderson. "So that'll be the next stage of development." Indeed, rummaging in a cupboard or darting across the kitchen, are currently beyond the realms of the giant mechanical arms which hover above a specially designed hob. The Robot Chef went on show at manufacturing trade fair, Hannover Messe, in Germany last week. But the robot's lack of spontaneity -- what cook hasn't added a little extra salt here or there? -- is also what makes it the "ultimate sous chef," according to Anderson. "It's so consistent, it always makes the exact same bowl of food. And that's the mark of a really great chef," he said. "You know it won't try and improvise or use an intuition -- because it has none." That said, no two ingredients are necessarily the same, and engineers are now developing extra sensors for such delicate tasks as beating egg whites into perfectly stiff peaks. "Things such as whisking egg whites into a meringue is very visual, because every egg is a little bit different," explained Anderson. "But a robot will still be able to tell when it's reached a certain consistency, by feedback from the pressure and friction in the egg whites as they're whipped." So what kind of person would actually own a robot chef? The kind that are too tired, too strapped for time, or just too apathetic to cook, says Anderson. "It could also be an advantage for disabled people who want freshly cooked food but don't have a carer," he added. And then there's the people who might just want to show off their futuristic new kitchen appliance. 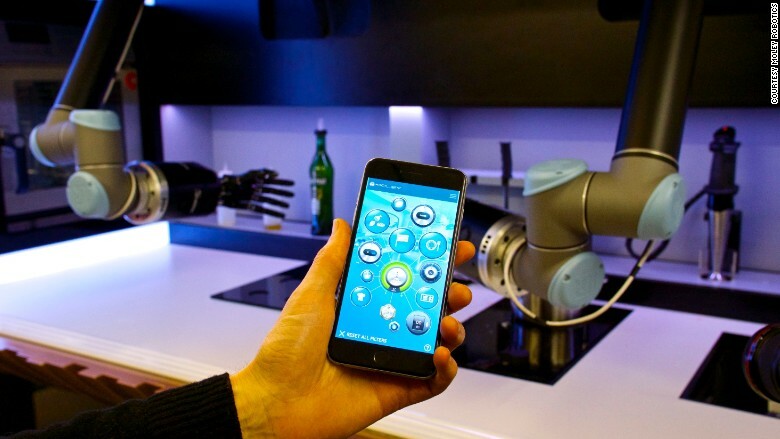 Thousands of recipes could just be a click away, with the Robot Chef app. "The early adopters are going to be people saying 'hey, come to my house, I've got this amazing robot chef, you should see what it does, you should taste the bisque,'" said Anderson. "Everyone loves a bit of theater with their food." The high-tech machine might be able to mimic a Master Chef -- but can it ever really cook with love and care? "Cooking with love is down to the effort that goes into it," said Anderson. "If somebody makes you a lasagne then you know they love you because a lasagne is a lot of work! "The robot could make food that would taste just like how a human would make it -- but it can never really capture that sentiment." It seems there's still some improvements to be made before Robot Chef hits the market in two years. Expressing love, might just be one of them.